The Audi TT boasts an iconic and instantly recognisable design. That made its first appearance in 1998. It has seen many updates since then and is now one of the most popular sports cars on our roads. Extra models have been added to both ends of the range, showing off the success of this model. The Audi TT is all about good looks, powerful performance and style. So, if you’re looking for a stylish car that won’t break the bank, take a look at the selection of used Audi TTs. With plenty of second-hand Audi TTs on offer at RAC Cars, you’ll be getting an effortless retro-cool interior, that uses attention to detail and superior engineering. There is a massive range of extras available, so you could end up with a bunch of interesting additions when buying a used Audi TT. Interior space can be limited; however, this has come on leaps and bounds with the newer models. But, it is the pure power and elegance if this car that attracts buyers. 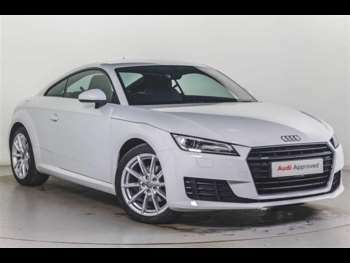 From the freakishly fast Audi TT Plus to the aggressive Audi TT TTS, there is the perfect model out there for everyone. Dynamic and stylish, a used Audi TT is rapid on the road and handles extremely well. With the lightweight aluminium body, the Audit TT is quick and sharp. Both the performance and technology of a used Audi TT are unmatched. The Audi TT range has produced some wonderful cars, all of which perform like a firecracker, handle beautifully and drive incredibly well. The Audi TT Coupe has been named the “What Car?” Coupe of the Year for 7 consecutive years since 2007.